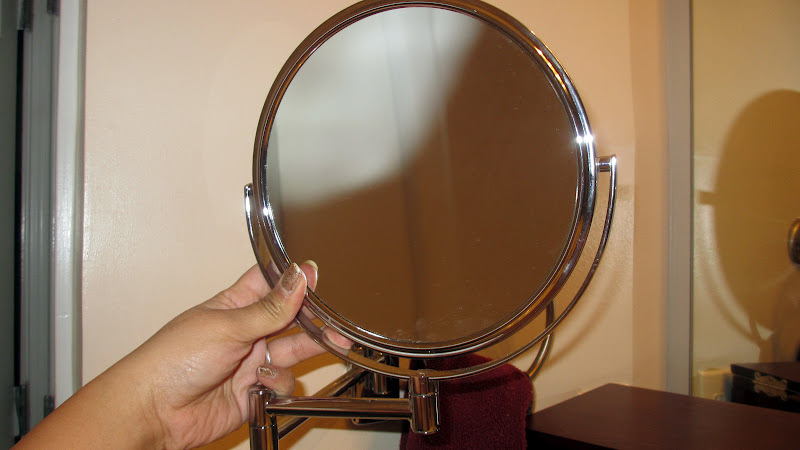 Home favorites Product Spotlight: Makeup Mirror Must-Have! I'm back with another post. Today I wanted to feature something that I am absolutely loving lately. I'd wait to feature it in next month's favorites but I want to share it now! 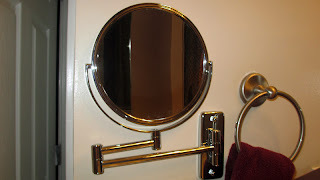 Have you ever had to fumble with different mirrors when doing your makeup? You're using the big bathroom mirror to do foundation...then need to switch to a hand held to get your eyeshadow...then a magnifying to do your brows...all the while limiting your ability to hold your brushes and making the process too cumbersome. Well recently I purchased something that solves all of that! A few weeks ago, I was watching a YouTube video from my girl loulud83. 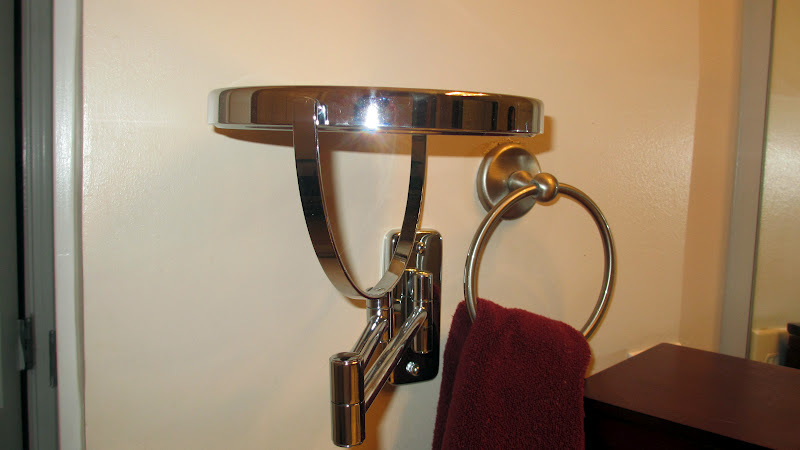 During a makeup collection tour, she mentioned that she had installed a mirror with a swiveling ARM in her bathroom. I thought, what I great idea! It's the kind that you may see in a hotel room...convenient for girls doing makeup or guys shaving. I was hooked! I made a stop at Bath Bath and Beyond because I knew they would have this type of mirror, plus you can use their coupons! The one I purchased retailed for around $30 but I received 20% off. You can probably find these mirrors in any home housewares aisle. The ARM Swivels out and the mirror part flips so you can use either the normal side or magnified side. I positioned the mirror on my wall so it can be placed flat out of the way and then extended at eye level so I can get a real close look when doing my makeup and all the while it's hands free. You don't have to worry about using up precious counter space and it's quick and easy to install. It took my boyfriend about 5 minutes to put it up. You just have to screw it into the wall. Just make sure that you make room so that the ARM doesn't poke out off the wall when it's folded back into place. This mirror has truly made my makeup game so much easier. It saves time and it helps me do a better job. I definitely recommend! FTC Disclosure: Product purchased by me. WHAT?! You can buy these? Must.get. Thanks for sharing, Ren! This would be super handy! Thanks!